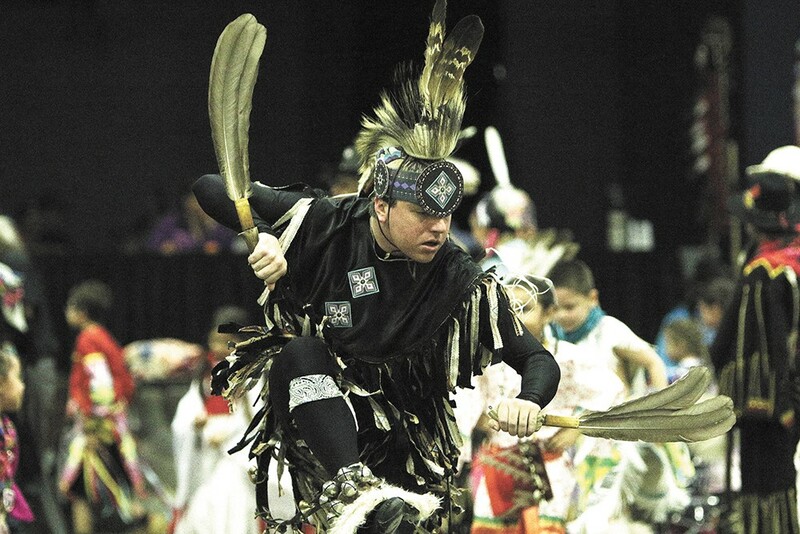 Robert Wynecoop, of the Spokane Tribe, dancing at an event earlier this year. Similar dances will be held at the first-ever Cultural Experience at the Coeur d'Alene Casino Resort. It was the machines, and the anger and arguments surrounding them, that ended with the Coeur d'Alene Tribe canceling the largest outdoor powwow in the Northwest. Specifically, it was a crowd of "historical horse racing" machines at the Greyhound Park and Event Center that became objects of contention for Idaho's tribes. The machines, legalized in Idaho in 2013, were supposed to give bettors a chance to bet on historical horse races at racing tracks, just like they could bet on modern races. In reality, they turned out a lot more like conventional slot machines, complete with spinning reels, blinking lights and select-the-treasure-chest bonus rounds. The tribes, which had struck exclusive gaming compacts, cried foul. Meanwhile, the Julyamsh Powwow, complete with 1,600 dancers, was supposed to take place at the Greyhound Park — a business kept afloat by the controversial machines. The tribe's cultural committee scrambled, looking for another place to hold the powwow. "There wasn't enough time to do it right, nor did we have a location that would fit our needs," says Heather Keen, spokeswoman for the tribe. There's no replacement for the Julyamsh Powwow, but as an alternative, check out the tribe's cultural experience event on July 18, appropriately called "Cultural Experience." "I'm trying to build a sense of togetherness," says Quanah Matheson, the cultural affairs director for the Coeur d'Alene Casino Resort. "I want everybody to feel comfortable, and feel good when they leave. And learn something new about us." The concept isn't new. For six years, the tribe's been putting on an event called Winter Blessing, inspired by its wintertime traditions of pulling everyone together in the warmth of longhouses and sharing stories. As many as 1,000 visitors have come to Winter Blessing in years past to eat frybread, hear tales and watch fireworks. Cultural Experience, by contrast, gets its inspiration from the foods, dances and songs of summer, when the tribe would catch salmon, of course, funneling them into narrow channels to make the fish easy to snare, spear or net. Families would get together and make huckleberry-picking pilgrimages up into the surrounding mountains of Idaho and western Montana. As the women would pick berries and dig for camas roots, the men would provide protection and hunt game. And so every attendee of the Cultural Experience will be handed gifts of huckleberry jam and salmon. No charge. The event is free, a celebration of the tribe's tradition of generosity. "We're gifting away salmon. We're gifting away huckleberries," Matheson says. "We're showing our dances that come from here. Our songs that come from here." There's the traditional Prairie Chicken Dance from the male dancers, drawing from the story of an animal appearing to a young man in crisis. These are old dance moves, passed from dancer to dancer through decades of powwow traditions all across America. There's the traditional female dance, a rhythmic interpretation of digging for camas roots. And then comes the dubstep. When Matheson wanted a way to merge the traditional with the modern, he turned to his son. "I suggested it," says Kodamen, 14. "I've been dancing [dubstep] for a little while. I thought it would be cool." The Canadian musical group A Tribe Called Red already mixes the tribal drum beat with dubstep's rat-a-tat electronic distortions. So Kodamen will create the same sort of combination in his dance steps, powwow moves combined with dubstep moves. It's mash-up as metaphor. Because as much as tradition is still part of native life, as much as the memories of picking huckleberries, digging roots and catching salmon a century ago still resonate, Matheson wants to remind the audience that they're still a people very much in the present. They're still very much enmeshed with modern life.